A vertical crack in a concrete block or poured concrete foundation wall isn’t necessarily a settlement crack. More often than not, it is due to expansion and contraction of the concrete along with the absence of a control joint. A settlement crack is, more specifically, due to differential settlement, which is the uneven settlement of the foundation. Once the shear strength of the concrete has been exceeded, a crack originates at the footing and proceeds gradually upward along the visible portion of the wall. When observing a vertical crack, if it extends at least down to the basement floor, a variety of methods and criteria are available to make a further determination. 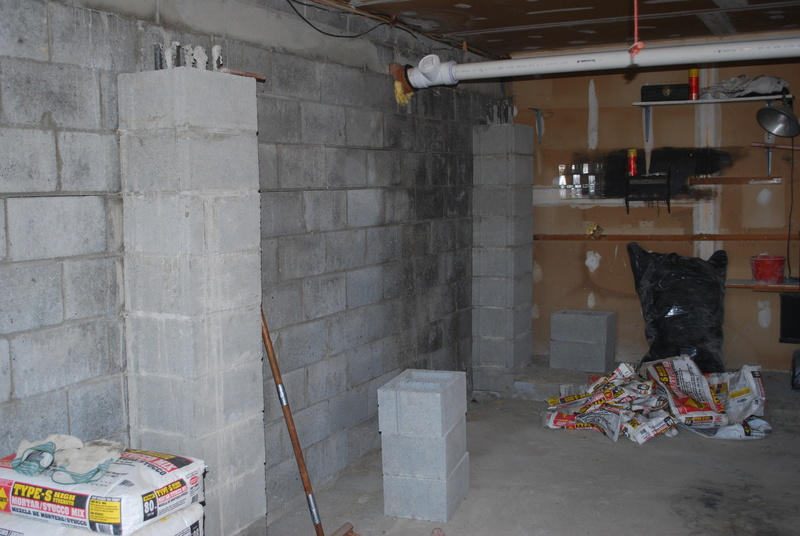 Absolute determination is possible by excavation down to the footing, either from the outside or inside of the wall. However, that is not always practical. Widening of the crack as it is observed closer to the basement floor tends to support the supposition that the crack is settlement-driven. The converse is also true: narrowing of the crack as it is observed closer to the basement floor is evidence that the crack is not settlement-driven. A visible drop in the elevation across the crack, from one side to the other, is fairly strong evidence that differential settlement has occurred. Making this determination is not always simple due to the irregularities typical in the contours of the crack. Vertical cracks due to expansion and contraction can be addressed by filling the cracks, creating permanent control joints, or both. Although vertical cracks are typically not of structural significance when they first appear, in areas of heavily saturated soil water intrusion and ice formation may eventually lead to more critical damage. Differential settlement cracks can be filled typically. The question that remains, however, is whether the settlement will continue if the underlying cause is not addressed. In some instances, primary consolidation of the soil has largely concluded so that no additional measures must be undertaken. In other instances, settlement will continue for many years and lead ultimately to substantial failure of the wall and related components within the home or building. Making this determination requires years of forensic experience, an objective system of measurement and deduction, and in some cases laboratory analysis of the soil. Where substantial repair of settlement is required, available methods include underpinning, support of the existing footing with permanent hydraulic jacks, drainage improvements, and in rare instances replacement of the wall. A horizontal crack in a concrete block or poured concrete foundation wall may be a sign of structural failure, either in progress or complete. A horizontal crack tends to indicate inward bowing of the wall, with the crack acting as a hinge. Bowing is caused by soil pressure, hydraulic pressure, frost pressure, or some other cause such as the root system of a tree. The severity of the horizontal crack can be expressed in terms of measurable factors such as its length, width, and the distance and angle of bowing. As a rule of thumb, a wall is unstable if the lateral displacement is equal to or greater than half the width of the wall. However, lateral displacement of as little as 1 to 2 inches is of great concern and may indicate the beginnings of structural instability. Once the concrete bonds have been broken, any remaining stability is due to friction. 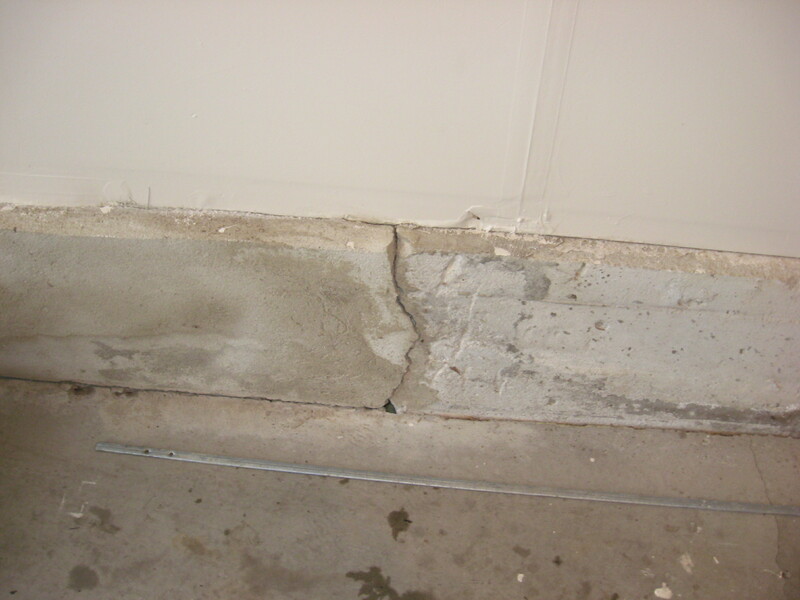 Moreover, the presence of the crack will allow water intrusion and lead to accelerated deterioration of the wall. Diagnosing the exact cause or causes of the horizontal crack requires forensic engineering. A poor drainage condition, soil with high clay content, inadequate wall thickness, and various design and construction flaws may contribute individually or in concert to promote horizontal cracking and bowing. Where cracking and bowing are very limited, correction of a poor drainage condition along with minor repairs may be sufficient to restore full structural integrity. However, more substantial repair or reinforcement is necessary in a majority of all cases. Reinforcement options include grouting solid the block cavities, construction of buttresses, installation of tiebacks, increasing the depth of the wall with Gunite (sprayed on concrete), or partial reconstruction of the wall. These approaches require an engineering analysis as well as a detailed set of drawings. To resolve your structural issue, contact us here.